University Council member Peter McNaney CBE. Dr Peter Mc Naney CBE graduated from the University of Manchester with an LLB in 1980 and practised as a Solicitor for 20 year before becoming Chief Executive of Belfast City Council . He served in that role for 14 years and stood down in 2014. 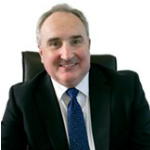 He is presently a Board member of Invest NI and the Chair of the Belfast Health and Social Care Trust. Peter is married to Karen and they have 4 children. He enjoys hill walking, current affairs and sport although now mostly watching rather than participating.